Aristotle (384 BC - March 7, 322 BC) was an ancient Greek philosopher, student of Plato and teacher of Alexander the Great. He wrote many books about physics, poetry, zoology, logic, rhetoric, government, and biology. Aristotle, along with Plato and Socrates, are generally considered the three most influential ancient Greek philosophers in Western thought. Among them they transformed Presocratic Greek philosophy into the foundations of Western philosophy as we know it. The writings of Plato and Aristotle form the core of Ancient philosophy. Aristotle placed much more value on knowledge gained from the senses and would correspondingly be better classed among modern empiricists (see materialism and empiricism). He also achieved a "grounding" of dialectic in the Topics by allowing interlocutors to begin from commonly held beliefs (Endoxa); his goal being non-contradiction rather than Truth. He set the stage for what would eventually develop into the scientific method centuries later. Although he wrote dialogues early in his career, no more than fragments of these have survived. The works of Aristotle that still exist today are in treatise form and were, for the most part, unpublished texts. These were probably lecture notes or texts used by his students, and were almost certainly revised repeatedly over the course of years. As a result, these works tend to be eclectic, dense and difficult to read. Among the most important ones are Physics, Metaphysics, Nicomachean Ethics, Politics, De Anima (On the Soul) and Poetics. Their works, although connected in many fundamental ways, are very different in both style and substance. Aristotle is known for being one of the few figures in history who studied almost every subject possible at the time. In science, Aristotle studied anatomy, astronomy, embryology, geography, geology, meteorology, physics, and zoology. In philosophy, Aristotle wrote on aesthetics, economics, ethics, government, metaphysics, politics, psychology, rhetoric and theology. He also dealt with education, foreign customs, literature and poetry. His combined works practically comprise an encyclopedia of Greek knowledge. Aristotle was born at Stageira, a colony of Andros on the Macedonian peninsula of Chalcidice in 384 BC. His father, Nicomachus, was court physician to King Amyntas III of Macedon. It is believed that Aristotle's ancestors held this position under various kings of Macedonia. As such, Aristotle's early education would probably have consisted of instruction in medicine and biology from his father. About his mother, Phaestis, little is known. It is known that she died early in Aristotle's life. When Nicomachus also died, in Aristotle's tenth year, he was left an orphan and placed under the guardianship of his uncle, Proxenus of Atarneus. He taught Aristotle Greek, rhetoric, and poetry (O'Connor et al., 2004). Aristotle was probably influenced by his father's medical knowledge; when he went to Athens at the age of 18, he was likely already trained in the investigation of natural phenomena. From the age of 18 to 37 Aristotle remained in Athens as a pupil of Plato and distinguished himself at the Academy. The relations between Plato and Aristotle have formed the subject of various legends, many of which depict Aristotle unfavourably. No doubt there were divergences of opinion between Plato, who took his stand on sublime, idealistic principles, and Aristotle, who even at that time showed a preference for the investigation of the facts and laws of the physical world. It is also probable that Plato suggested that Aristotle needed restraining rather than encouragement, but not that there was an open breach of friendship. In fact, Aristotle's conduct after the death of Plato, his continued association with Xenocrates and other Platonists, and his allusions in his writings to Plato's doctrines prove that while there were conflicts of opinion between Plato and Aristotle, there was no lack of cordial appreciation or mutual forbearance. Besides this, the legends that reflect Aristotle unfavourably are traceable to the Epicureans, who were known as slanderers. If such legends were circulated widely by patristic writers such as Justin Martyr and Gregory Nazianzen, the reason lies in the exaggerated esteem Aristotle was held in by the early Christian heretics, not in any well-grounded historical tradition. After the death of Plato (347 BC), Aristotle was considered as the next head of the Academy, a post that was eventually awarded to Plato's nephew. Aristotle then went with Xenocrates to the court of Hermias, ruler of Atarneus in Asia Minor, and married his niece and adopted daughter, Pythia. In 344 BC, Hermias was murdered in a rebellion, and Aristotle went with his family to Mytilene. It is also reported that he stopped on Lesbos and briefly conducted biological research. Then, one or two years later, he was summoned to Pella, the Macedonian capital, by King Philip II of Macedon to become the tutor of Alexander the Great, who was then 13. It is possible that Aristotle also participated in the education of Alexander's boyhood friends, which may have included for example Hephaestion and Harpalus. Aristotle maintained a long correspondence with Hephaestion, eventually collected into a book, unfortunately now lost.According to sources such as Plutarch and Diogenes, Philip had Aristotle's hometown of Stageira burned during the 340s BC, and Aristotle successfully requested that Alexander rebuild it. During his tutorship of Alexander, Aristotle was reportedly considered a second time for leadership of the Academy; his companion Xenocrates was selected instead. During the thirteen years (335 BCÐ322 BC) which he spent as teacher of the Lyceum, Aristotle composed most of his writings. Imitating Plato, he wrote Dialogues in which his doctrines were expounded in somewhat popular language. He also composed the several treatises (which will be mentioned below) on physics, metaphysics, and so forth, in which the exposition is more didactic and the language more technical than in the Dialogues. When reported or imitated in writing, "dialogue" labels a form of literature invented by the Greeks for purposes of rhetorical entertainment and instruction, and scarcely modified since the days of its invention. These writings show to what good use he put the resources Alexander had provided for him. They show particularly how he succeeded in bringing together the works of his predecessors in Greek philosophy, and how he pursued, either personally or through others, his investigations in the realm of natural phenomena. Pliny claimed that Alexander placed under Aristotle's orders all the hunters, fishermen, and fowlers of the royal kingdom and all the overseers of the royal forests, lakes, ponds and cattle-ranges, and Aristotle's works on zoology make this statement more believable. Aristotle was fully informed about the doctrines of his predecessors, and Strabo asserted that he was the first to accumulate a great library. During the last years of Aristotle's life the relations between him and Alexander became very strained, owing to the disgrace and punishment of Callisthenes, whom Aristotle had recommended to Alexander. 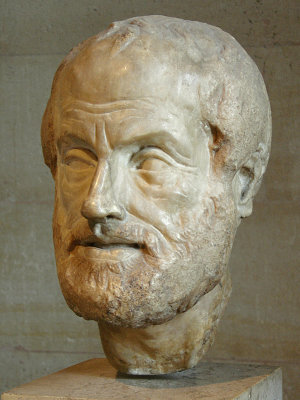 Nevertheless, Aristotle continued to be regarded at Athens as a friend of Alexander and a representative of Macedonia. Consequently, when Alexander's death became known in Athens, and the outbreak occurred which led to the Lamian war, Aristotle shared in the general unpopularity of the Macedonians. The charge of impiety, which had been brought against Anaxagoras and Socrates, was now, with even less reason, brought against Aristotle. He left the city, saying (according to many ancient authorities) that he would not give the Athenians a chance to sin a third time against philosophy. He took up residence at his country house at Chalcis, in Euboea, and there he died the following year, 322 BC. His death was due to a disease, reportedly 'of the stomach', from which he had long suffered. The story that his death was due to hemlock poisoning, as well as the legend that he threw himself into the sea "because he could not explain the tides," is without historical foundation. Very little is known about Aristotle's personal appearance except from hostile sources. The statues and busts of Aristotle, possibly from the first years of the Peripatetic School, represent him as sharp and keen of countenance, and somewhat below the average height. His character - as revealed by his writings, his will (which is undoubtedly genuine), fragments of his letters and the allusions of his unprejudiced contemporaries - was that of a high-minded, kind-hearted man, devoted to his family and his friends, kind to his slaves, fair to his enemies and rivals, grateful towards his benefactors. When Platonism ceased to dominate the world of Christian speculation, and the works of Aristotle began to be studied without fear and prejudice, the personality of Aristotle appeared to the Christian writers of the 13th century, as it had to the unprejudiced pagan writers of his own day, as calm, majestic, untroubled by passion, and undimmed by any great moral defects, "the master of those who know". Aristotle's legacy also had a profound influence on Islamic thought and philosophy during the middle ages. The likes of Avicenna, Farabi, and Yaqub ibn Ishaq al-Kind were a few of the major proponents of the Aristotelian school of thought during the Golden Age of Islam. Aristotle defines philosophy in terms of essence, saying that philosophy is "the science of the universal essence of that which is actual". Plato had defined it as the "science of the idea", meaning by idea what we should call the unconditional basis of phenomena. Both pupil and master regard philosophy as concerned with the universal; Aristotle, however, finds the universal in particular things, and called it the essence of things, while Plato finds that the universal exists apart from particular things, and is related to them as their prototype or exemplar. For Aristotle, therefore, philosophic method implies the ascent from the study of particular phenomena to the knowledge of essences, while for Plato philosophic method means the descent from a knowledge of universal ideas to a contemplation of particular imitations of those ideas. In a certain sense, Aristotle's method is both inductive and deductive, while Plato's is essentially deductive. In Aristotle's terminology, the term natural philosophy corresponds to the phenomena of the natural world, which include: motion, light, and the laws of physics. Many centuries later these subjects would later become the basis of modern science, as studied through the scientific method. The term philosophy is distinct from metaphysics, which is what moderns term philosophy. In the larger sense of the word, he makes philosophy coextensive with reasoning, which he also called "science". Note, however, that his use of the term science carries a different meaning than that which is covered by the scientific method. "All science (dianoia) is either practical, poetical or theoretical." By practical science he understands ethics and politics; by poetical, he means the study of poetry and the other fine arts; while by theoretical philosophy he means physics, mathematics, and metaphysics. Aristotle's theory of universals is one of the classic solutions to the problem of universals. Aristotle thought - to put it in a not-very-enlightening way - that universals are simply types, properties, or relations that are common to their various instances. In Aristotle's view, universals exist only where they are instantiated; they exist only in things (he said they exist in re, which means simply "in things"), never apart from things. Beyond this Aristotle said that a universal is something identical in each of its instances. So all red things are similar in that there is the same universal, redness, in each red thing. There is no Platonic form of redness, standing apart from all red things; instead, in each red thing there is the same universal, redness. First of all, on Aristotle's view, universals can be multiply instantiated. Aristotle stresses, after all, the one and the same universal, applehood (say), that appears in each apple. Common sense might detect a problem here. (The problem can arise for other forms of realism about universals, however.) Namely, how can we make sense of exactly the same thing being in all of these different objects? That after all is what the theory says; to say that different deserts, the Sahara, the Atacama, and the Gobi are all dry places, is just to say that the exact same being, the universal dryness, occurs at each place. Universals must be awfully strange entities if exactly the same universal can exist in many places and times at once, or so one might think. But maybe that's not so troubling; it seems troubling if we expect universals to be like physical objects, but remember, we are talking about a totally different category of being. So a common defense of realism (and hence of Aristotle's realism) is that we should not expect universals to behave as ordinary physical objects do. Maybe then it is not so strange, then, to say that the exact same universal, dryness, occurs all over the earth at once; after all, there is nothing strange about saying that different deserts can be dry at the same time. The Organon is the name given by Aristotle's followers, the Peripatetics, for the standard collection of six of his works on logic. The system of logic described in two of these works, namely On Interpretation and the Prior Analytics, often called Aristotelian logic, is discussed in the article on term logic. Aristotle "says that 'on the subject of reasoning' he 'had nothing else on an earlier date to speak about'". However, Plato reports that syntax was thought of before him, by Prodikos of Keos, who was concerned by the right use of words. Logic seems to have emerged from dialectics, the earlier philosophers used concepts like reductio ad absurdum as a rule when discussing, but never understood its logical implications. Even Plato had difficulties with logic. Although he had the idea of constructing a system for deduction, he was never able to construct one. Instead, he relied on his dialectic, which was a confusion between different sciences and methods. Plato thought that deduction would simply follow from premises, so he focused on having good premises so that the conclusion would follow. Later on, Plato realiszed that a method for obtaining the conclusion would be beneficial. Plato never obtained such a method, but his best attempt was published in his book Sophist, where he introduced his division method. The order of the books (or the teachings from which they are composed) is not certain, but this list was derived from analysis of Aristotle's writings. There is one volume of Aristotle's concerning logic not found in the Organon, namely the fourth book of Metaphysics. Aristotle is also the creator of syllogisms with modalities (modal logic). The word modal refers to the word 'modes', explaining the fact that modal logic deals with the modes of truth. Aristotle introduced the qualification of 'necessary' and 'possible' premises. He constructed a logic which helped in the evaluation of truth but which was very difficult to interpret. This is the material that makes up an object, for example, "the bronze and silver ... are causes of the statue and the bowl." The Material Cause, that out of which the statue is made, is the marble or bronze. The material cause implies the capacity of existence to reside in the substance of the material of which the universe is made. Most scientific inquiry involves that concept, thus ignores the formal cause, touches on the efficient cause, and denies the final cause. Some scientific discussion does imply a teleological cause in biology by suggesting that organisms seek to propagate themselves as a condition of their genome. Survival of the fittest implies a teleological cause or desire to improve future generations. This is the blueprint or the idea commonly held of what an object should be. Aristotle says, "The form is the account (and the genera of the account) of the essence (for instance, the cause of an octave is the ratio two to one, and in general number), and the parts that are in the account." This is the person who makes an object, or "unmoved movers" (gods) who move nature. For example, "a father is a cause of his child; and in general the producer is a cause of the product and the initiator of the change is a cause." This is closest to the modern definition of "cause". Additionally, things can be causes of one another, causing each other reciprocally, as hard work causes fitness and vice versa, although not in the same way or function, the one is as the beginning of change, the other as the goal. [Thus Aristotle first suggested a reciprocal or circular causality as a relation of mutual dependence or action or influence of cause and effect.] Also, Aristotle indicated that the same thing can be the cause of contrary effects, its presence and absence may result in different outcomes. All further investigations of causality will consist of imposing the favorite hierarchies on the order causes, such as final > efficient> material > formal (Thomas Aquinas), or of restricting all causality to the material and efficient causes or to the efficient causality (deterministic or chance) or just to regular sequences and correlations of natural phenomena (the natural sciences describing how things happen instead of explaining the whys and wherefores). Proper Causation: Things take place for the sake of something, and the result is that which is intended. Accidental Causation: Things that take place not out of necessity, i.e. things that take place by chance/coincidence. This cause is indeterminable. Chance lies in the realm of accidental causes. It is "from what is spontaneous" (but note that what is spontaneous does not come from chance). For a better understanding of Aristotle's conception of "chance" it might be better to think of "coincidence": Something takes place by chance if a person sets out with the intent of having one thing take place, but with the result of another thing (not intended) taking place. However, chance can only apply to human beings. According to Aristotle, chance must involve choice (and thus deliberation), and only humans are capable of deliberation and choice. "What is not capable of action cannot do anything by chance" (Physics, 2.6). Fire which is hot and dry. Earth which is cold and dry. Air which is hot and wet. Water which is cold and wet. These four elements interchange (i.e. Fire, Air, Water, Earth), while aether is on its own. The Sun keeps this cycle going. God keeps the Sun going (and thus the Sun is eternal). Aristotle believed that ethical knowledge is not certain knowledge (like metaphysics and epistemology) but is general knowledge. Also, as it is not a theoretical discipline, he thought a person had to study in order to become "good." Thus, if a person was to become virtuous, they could not simply study what virtue is, they had to actually do virtuous activity. In order to do this, Aristotle had to first establish what was virtuous. He began by determining that everything was done with some goal in mind and that goal is 'good.' The ultimate goal he called the Highest Good. Aristotle contested that happiness could not be found only in pleasure or only in fame and honor. He finally finds happiness "by ascertaining the specific function of man. But what is this function that will bring happiness? To determine this, Aristotle analyzed the soul and found it to have three parts: the Nutritive Soul (plants, animals and humans), the Perceptive Soul (animals and humans) and the Rational Soul (humans only). Thus, a human's function is to do what makes it human, to be good at what sets it apart from everything else: the ability to reason or Nous. A person that does this is the happiest because they are fulfulling their purpose or nature as found in the rational soul. Depending on how well they did this, Aristotle said people belonged to one of four categories: the Virtuous, the Continent, the Incontinent and the Vicious. Aristotle believes that every ethical virtue is an intermediate condition between excess and deficiency. This does not mean Aristotle believed in moral relativism, however. He set certain emotions (e.g., hate, envy, jealousy, spite, etc.) and certain actions (e.g., adultery, theft, murder, etc.) as being always wrong, regardless of the situation or the circumstances. In Nicomachean Ethics, Aristotle focuses on the importance of continually behaving virtuously and developing virtue rather than committing specific good actions. This can be opposed to Kantian ethics, in which the primary focus is on individual action. Nicomachean Ethics emphasizes the importance of context to ethical behavior - what might be right in one situation might be wrong in another. Aristotle believed that happiness is the end of life and that as long as a person is striving for goodness, good deeds will result from that struggle, making the person virtuous and therefore happy. Aristotle has been criticised on several grounds. His analysis of procreation is frequently criticised on the grounds that it presupposes an active, ensouling masculine element bringing life to an inert, passive, lumpen female element; it is on these grounds that some feminist critics refer to Aristotle as a misogynist. At times, the objections that Aristotle raises against the arguments of his own teacher, Plato, appear to rely on faulty interpretations of those arguments. Although Aristotle advised, against Plato, that knowledge of the world could only be obtained through experience, he frequently failed to take his own advice. Aristotle conducted projects of careful empirical investigation, but often drifted into abstract logical reasoning, with the result that his work was littered with conclusions that were not supported by empirical evidence; for example, his assertion that objects of different mass fall at different speeds under gravity, which was later refuted by John Philoponus. Credit is often given to Galileo, even though Philopinus lived centuries before him. In the Middle Ages, roughly from the 12th century to the 15th century, the philosophy of Aristotle became firmly established dogma. Although Aristotle himself was far from dogmatic in his approach to philosophical inquiry, two aspects of his philosophy might have assisted its transformation into dogma. His works were wide-ranging and systematic so that they could give the impression that no significant matter had been left unsettled. He was also much less inclined to employ the sceptical methods of his predecessors, Socrates and Plato. Some academics have suggested that Aristotle was unaware of much of the current science of his own time, and that he was a far lesser mathematician than many of his learned contemporaries. The Western mind is "Aristotelian". By this we mean that it formats the external world into factual and "scien"-tific categories. (By "Scien"-tific we mean that something is knowable or known. Latin scientia = knowledge). Under the premise of external categorization, the Aristotelian mind has come to equate "experience" with the unified chronical and spatial ontological structure that is the "external" universe -- visible, audible and sensible by the handful of our common, well-identified senses. By so equating the two, the Aristotelian mind is fully confident, or fully "positive" of the meanings of its utterances and the purposes of all actions. That is to say, it dismisses the possibility of dubious meanings as interpreted by subjects that are at variance in perspectives or phenomenology, and it dismisses the importance of anything other than an objectively defined "purpose" to an action. Therefore, the Aristotelian mind assumes that when subject A utters "I am X," he or she is referring to the same experience and is expressing the same purpose as subject B who also utters "I am X." The extant works of Aristotle are broken down according to the five categories in the Corpus Aristotelicum. The Corpus Aristotelicum refers to the traditional ordering and categorization of the works of Aristotle, dating back to the 2nd century. Although the works were all considered to be genuine until recently, modern scholarship has cast doubts on the authenticity on many of the texts. The only major work of Aristotle's not in the Corpus Aristotelicum is the Constitution of the Athenians. Not all of these works are considered genuine, but differ with respect to their connection to Aristotle, his associates and his views. Some, such as the Athenaion Politeia or the fragments of other politeia are regarded by most scholars as products of Aristotle's "school" and compiled under his direction or supervision. Other works, such On Colours may have been products of Aristotle's successors at the Lyceum, e.g., Theophrastus and Straton. Still others acquired Aristotle's name through similarities in doctrine or content, such as the De Plantis, possibly by Nicolaus of Damascus. A final category, omitted here, includes medieval palmistries, astrological and magical texts whose connection to Aristotle is purely fanciful and self-promotional. Those that are seriously disputed are marked with an asterisk.